In the Everything About Concrete Blog we'll keep you updated about new and improved concrete placing and finishing techniques being used by concrete contractors that are saving them time and money. We'll also talk about new and improved concrete products and tools being used out in the field that are making our jobs easier and increasing the quality and value of the finished products we are installing. Continue reading "How To Fix A Leak In A Basement Wall - Free Video Tutorial - Fix Crack"
I'll show you how to use concrete kneeboards to mag float a patio slab in preparation for a broom finish. Continue reading "How to use concrete kneeboards and concrete sliders"
As a professional I use epoxy concrete crack repair products all the time. Here's my tips and tutorial on how to quickly repair cracks and spalls in concrete. Continue reading "DIY Epoxy Concrete Crack Repair - What I use - How I Repair Concrete"
How to fix cracks in concrete floors, slabs, driveways, and patios. I'm going to show you my step by step guide and video for repairing concrete cracks. Continue reading "How To Fix Cracks In Concrete Floors - diy repair kit, guide & video"
Don't buy a concrete edging tool until you read this! I'm going to tell you and show you the best kind of concrete edger to use if you're finishing any kind of concrete patios, pool decks, driveways, or walkways. Not all concrete edgers are created equal, find out why! Continue reading "Concrete Edging Tools - Don't buy a concrete edger until you read this"
What does stamped concrete cost? Here's my prices for installing stamped concrete patios, walkways, pool decks and more. You'll find the basic square foot cost of stamped concrete including the cost of labor, forming, concrete, color, and sealing. Continue reading "My Stamped Concrete Cost - What I charge to do stamped concrete"
Concrete Slab Calculator - Free calculator to figure concrete yardage. This free concrete calculator will estimate the amount of yardage for your concrete slabs, floors, walls, footings, and cylinders. Enter the depth, width, and length to calculate the amount of cubic yards needed for your concrete slab. Continue reading "Concrete Slab Calculator - Free calculator to figure concrete yardage." I'm a concrete contractor that will tell you what a concrete slab will cost. These are my actual prices I charge when I quote my customers. Continue reading "Don't get over charged! Here's my concrete slab cost in detail"
I'll share with you what I charge to install a concrete slab for a shed. From a 10x10 shed slab to a 20x20 and many sizes in between. I'm an actual concrete slab contractor that will give you the honest truth about what a shed slab costs. Continue reading "How much does a concrete slab cost for a shed, 12x12, 10x12, and more." Continue reading "CONCRETE MIXING RATIOS - WHAT IS THE BASIC MIXING RATIO FOR CONCRETE?" Continue reading "The 14 tools needed to build a concrete slab - How to form and pour it"
This is my top 10 list of concrete hand tools I feel every concrete flatwork contractor should have. I do concrete floors and slabs for a living and use these hand tools every day. These 10 tools for placing and finishing concrete are the most important ones in my opinion. Continue reading "My Top Ten List Of Concrete Hand Tools For Doing Concrete Flatwork"
How to use a laser level for grading and leveling the ground. I'll show you how to set it up, turn it on, and how the laser and receiver interact together to level and grade dirt, concrete, drainage pipes, plumbing, and much more. Continue reading "How to use a laser level for beginners - For grading & leveling ground"
These are the actual concrete mix ratios for 3000, 3500, 4000, and 4500 psi concrete that I use to pour concrete floors, patios, pool decks and more. I'll show you the actual concrete batch plant ticket with the cement, sand, and aggregate break downs for the yards we used. Continue reading "Actual Concrete Mix Ratios For 3000, 3500, 4000, and 4500 psi concrete"
On this page I'll tell you what I use for a concrete screed and why it works good to level a concrete floor, slab, patio, or driveway. Continue reading "The two best types of concrete screeds and why you should use them"
What I use for concrete stamping tools - My top recommendations! Find out what I use for concrete stamping tools on my jobs. As a stamped concrete contractor, I've used a lot of different stamping tools. On this page I'm going to share with you what I use for tools to get the best results on my stamped concrete. Continue reading "What I use for concrete stamping tools - My top recommendations!" On this page I give you my top pick for which concrete power trowel to choose if you pour and finish concrete floors. I have used this brand power trowel for many years with excellent results. Continue reading "My Top Recommendation for Choosing A Concrete Power Trowel"
I recommend what I believe is the best concrete saw for cutting contraction joints in green concrete floors. Continue reading "The best concrete saw for cutting contraction joints in green concrete"
I give you my top recommendations for vibrating concrete screeds. I use a power screed when I install my concrete floors. If you're thinking about purchasing one, I'll let you know what I like about them and what I dislike. Continue reading "My Top Recommendations For Vibrating Concrete Screeds - Power Screeds"
Here's my top 9 things to consider before pouring concrete in cold weather. 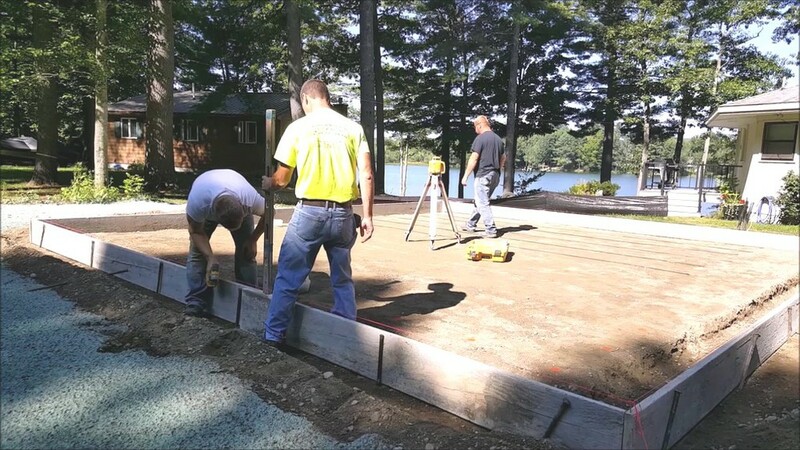 Coming from an experienced concrete contractor who pours concrete during winters in Maine. Continue reading "Be prepared, 9 things to consider before pouring concrete in cold weather"
Cold weather concrete talks about pouring concrete when temperatures are at or below freezing. How to prepare and protect the concrete. Continue reading "Cold Weather Concrete- What happens to fresh concrete when it freezes?" I show you exactly how much a yard of concrete weighs by showing you the concrete ticket from one of my concrete floor jobs. The ticket breaks down the weights of cement, sand, aggregate, and water used for the load of concrete. Continue reading "How Much Does A Yard Of Concrete Weigh"
These are the actual ready mix concrete prices I pay for 3000 psi, 3500 psi, and 4000 psi concrete mixes. Take a look at my invoices from two different ready mix concrete companies and see how much concrete costs per yard. 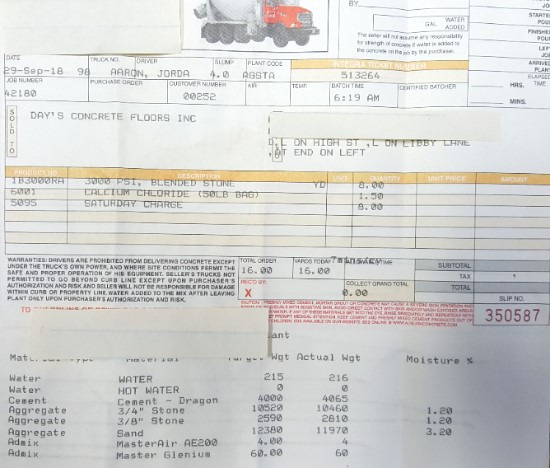 Continue reading "My ready mix concrete prices for 3000, 3500, & 4000 psi concrete"
How much does a 30' x 30' concrete slab cost, my actual prices from a real concrete contractor. I'm Mike Day and I own Day's Concrete Floors, Inc. I'm sharing my concrete slab prices with you to give you an honest idea what it cost to have a concrete slab installed. Continue reading "How much does a 30' x 30' concrete slab cost, My actual slab prices." You'll learn how to successfully reseal your stamped concrete pato, driveway, or pool deck. Also find out what NOT to do when resealing concrete. Continue reading "How do I reseal stamped concrete - Also what NOT to do before resealing"
Continue reading "Concrete Moisture Problems - The Effect It Has On Concrete Sealers"
Continue reading "Concrete Stain last for a long time"
Continue reading "Drilled through foundation and vapor barrier into dirt"
Take a look at the tools I have in my toolbox for doing concrete work. On this page I show you the tools I have in my toolbox for doing all kinds of concrete work. Continue reading "Take a look at the tools I have in my toolbox for doing concrete work." Best Concrete Deicer - What is the best deicer to use on concrete? The best concrete deicer in terms of melting power is without a question calcium chloride. Calcium chloride will melt ice on concrete in temperatures as low as -25 degrees Faranheit. Continue reading "Best Concrete Deicer - What is the best deicer to use on concrete?"